Quilting Arts TV is, hands down, the premiere source of quilt programming. In the Series 400 DVD set, host Patricia "Pokey" Bolton talks every week with experts and designers to bring viewers the best in tips, tricks, and advice. Quilting Arts markets itself as "where art and embellishment meet traditional quilt making," and the description couldn't be more accurate. Nowhere else will you find such a brilliant blend of new, exciting quilting ideas and time-honored techniques. 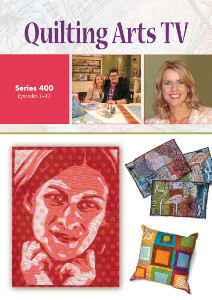 The Series 400 DVD set of Quilting Arts includes 13 wonderful episodes that cover a wide variety of topics, from hand-embroidery to computer-generated foundation-pieced kaleidoscope designs. Bolton meets with popular artists and insiders like Frieda Anderson, Andrea Bishop, and Jay McCaroll to discuss the latest in quilt-making. Episode 402, for example, includes a segment in which McCarroll talks about the quilting industry from an insider's perspective and Episode 406 explores various fabric trends and clever ways to combine patterns in quilt design. Maybe the best thing about this DVD set is that it has something for everybody. Whether an expert in the middle of a month-long king-size work of art or a beginner who's just looking for a few tips and an easy project to practice with, Series 400 of Quilting Arts has an episode relevant to every quilter's interests. Segments from episodes include tips for "no-fuss finishing for small art quilts," decorative stitching and embroidery, free-motion tips and tricks, and pattern drafting. If those are too basic, there are also segments on machine stitching alternate surfaces - including metal! - and over-dyeing commercial fabrics. In other words: if it can be quilted, Quilting Arts covers it. This DVD set is an excellent resource for advice, tips, and the latest information of new quilting tools and technology. It's the kind of quality programming which is as fun and interesting to watch for the tenth time as it is the first.